Oh man pkmncollectors, it's been too long. Since my 2 year anniversary was back in March, might as well do a small re-intro. 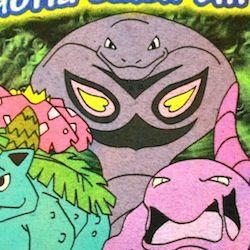 My name is Mar, and my main collections are Arbok, Ekans, and Seviper. I side collect Weepinbell, Drifblim, Drifloon, and Serperior. I tried to make it a habit to collect all the Poke-snakes, but post graduation life has been super super hectic, so I just concentrate on Arbok [since he's my all time favorite] and Seviper. I have searched and searched for one to no avail in fact one Target I went to restocked Series 1, so more Munna & Pidove to sit there with nobody to buy them., so does anyone here happen to have one they're selling that is under $20 as the price on Toywiz is outrageous. I'm in the process of moving and will hopefully have a collection update soonish. But right now I'm looking for a few cards and was hoping someone from the comm could help me out! To save on shipping I'm hoping to get them all from the same person. I'm looking for Articuno, Moltres, Zapdos, and maybe (probably) Kyogre EX (not full art) from Hail Blizzard/Psycho Drive in mint condition. Thank you! POKEMON DOLL STAMP Goodies now ready for pick-up preorder! Con Gets! Also, Leftover Sales! I'm back and fully recovered from my weekend at Anime Central! I have some Victini con gets to show you guys, and some leftover items that I didn't sell out of in the Artist's Alley. I'm not ready to post about custom amigurumi yet, but hopefully I will make that post this week. I really would like to get these guys to a good home first. I only have one of each Pokemon left, and I have about 10 Pokéballs. Starting on the left we have a very small MPC oops it is just a mini Banpresto! In the middle is the Takara Tomy talking Victini(which is embarrassingly high pitched). The little guy is actually a Banpresto key chain(removed) I've never seen before, so I had to get it! Finally on the right is a custom foam pin I got from someone in the Artist's Alley. I commissioned it ahead of time, and picked it up from her at the con. It is so cute! Last night i posted an update and i promised a video of the Pokemon Battle Stadium I recently got. Well, i have now decided to make videos of all of my electronics and just show off my collection updates on youtube. My first video was the Battle Stadium. Please note: i am a novice when it comes to cameras so they may not be the best videos at the start. I will be posting a video of my whole collection soon so if there is anything in it you would like to see in action, Feel free to ask. Also, sorry for the quick posts. I'm trying to get to California in July to see my boyfriend, and my lack of hours at work has led me to parting with more precious collection items. ; n; There's some rare items to be seen! Please check it out! I am getting really into dessert decoration and the like. I have made Happy Potter cakes, My Little Pony Cupcakes and more. I was visiting a kitchen supply store, browsing their decorating aisle, always an eye out for Pokemon stuff, when I found these! 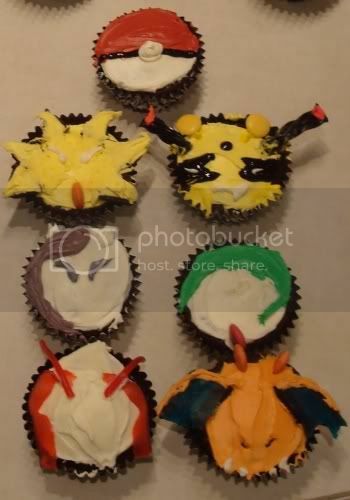 Sinnoh starter cake toppers! I've never seen figures like them before, so they do look like unique cake toppers. I didn't buy any myself since none of my friends are big Sinnoh fans, but I would be willing to do pick-ups if anyone was interested! You can see the price in the picture, but that's in Canadian dollars, and I'd be charging commission since the store isn't nearby. My sales permission comes from being grandfathered in. I also have some other quick questions for potential wants/trades! I'd especially like to know about prices - the cheaper, the better! I will try to get a sales post up soon as well! 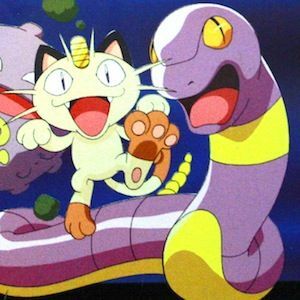 -Does anyone have a cheap Glameow Halloween plush they might be willing to sell? This is the only Glameow plush my friend is missing! -Would anyone be willing to trade a Ho-Oh HG/SS pre-release figure for the Reshiram bottlecap figure? -Even more of a long shot, but would anyone want to trade their Scyther TFG for my Dratini and/or Chimchar TFG? You can also view my Wishlist here! 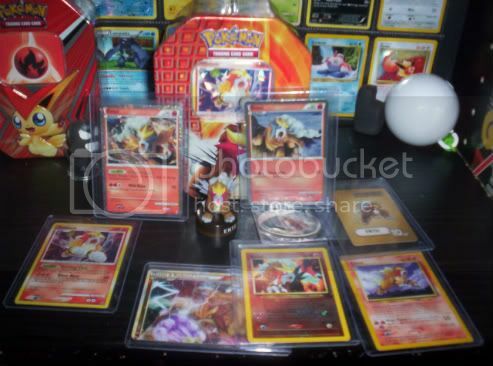 Hey Everyone~ I have finally received ALL the Entei stuff I have ordered during my first few weeks of being in the com~ I'd like to thank all of you I bought from, this collection has grown a lot and I love it! Now for a quick auction reminder!! You can click either the image or the link above to be transported to the original post! Take note, I'm going to have to change the ending date of the auction from Saturday the 5th to Thursday the 10th. Looking for a Scetile plush...but! 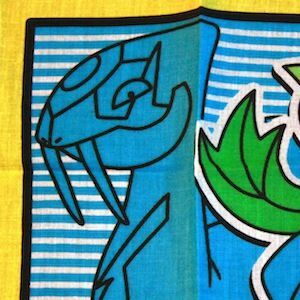 Why did Holland never sell Sceptile plushies? the thing is I saved money for an Anime convention next week I think no-one really want to sell there Sceptile plush since its really rare right? If I just could find someone who can hold on for a Sceptile untill 2 weeks (argh..why is Sceptile taunting me?) wish I was rich or something hehe.. If someone ever got a spare Sceptile hanging around, I would love to take it over! Hello everyone! Long time no update. My collection has certainly expanded since the last time I posted so I'm way overdue. Also, I bought a new bookshelf for my collections so now I can finally display them properly!!! A quick mini-intro for those who have no idea who I am. Hiya! I'm Dask. My main collection was Nidoran male, however, Tentacool and Tentacruel seem so to have taken over that spotlight. Though I still do collect him. 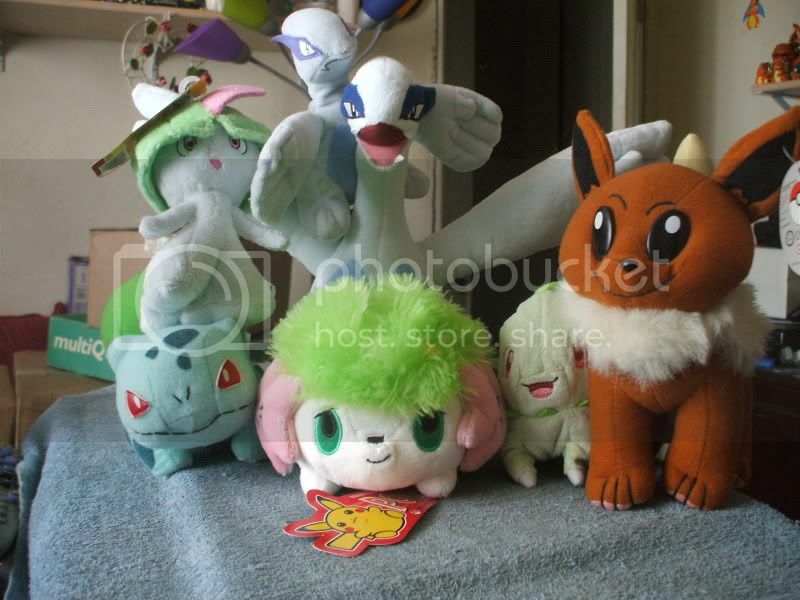 I also do have a couple side collections, which include Rayquaza, Frillish & Jellicent, and Donphan. Wants and 1:1 Talking Mew Auction! Update on Sales: I just got everything from my last sales post packaged up! They'll all be shipped tomorrow. I received sales permission sometime during the summer in 2010 by denkimouse. Collecting Reflections.... ARTICUNO ZUKAN AUCTION! SALES! ARTICUNO COLLECTION WEEDING! Hello community, I hope you are all doing well! I have recently had a few second thoughts about my collecting and feel as though I am falling away from it again. =\ When I use to buy items and receive them i would be excited, but now I find myself complacent with my feelings and not very excited. I am still interested in Pokemon and love to see peoples gets on the community, but I just feel like my collecting time is coming to a close. That being said, I have updated my sales page with some Articuno items including custom items, figures, and some other Pokemon items. I am toying with the notion of selling a few of my Articuno plush, but at the moment I am trying to avoid this. I still plan on being a part of the community, but I think I just need to reevaluate my collecting. Now, onto business! I updated my sales a bit with some new prices and a lot of items from my main collection. I will be adding more within the oncoming weeks, so if you are interested be on the lookout. You can get to my main sales by going to my profile and clicking the sales tab or by using the link below. Auctions reminder and quick sales <3. My auctions end in under 24 hours :3. Hello~ I'm Ivysaurr. I've been lurking this community for a long time, but only recently got the resources (read:paypal) to join and participate. I'm really excited to start buying and, eventually, selling Pokemon toys. Anyways, I look forward to meeting you all! I have not been here in quite some time. I have no money to collect at the moment due to an upcoming trip I have been saving up for the past few months. That being said, does anyone have any totodile plush for sale? A friend's birthday is coming up and he is a big fan of the totodile line, so I would LOVE to buy him a plush. removed the question about the nintendo store's stock. my apologies to the mods. For a while now, seeking the 2009 totodile canvas plush! Hey all, like a lot of people I've pretty much been a semi-lurker here since I think early March. So this is my very first post to the community. So far everyone I've spoken to has been really nice and I'm really happy to start really being a part of this place. I've loved pokemon since 98' but I never collected anything. However I absolutely adored collecting the TCGs. Sadly I've lost all the decks I used to own. I'm thinking of maybe re-collecting the original decks but for now it is just an idea.